Yes, it turned out fabulously. I love the taste of soup with a hint of dried anchovies and spices. The intense flavour in the soup was enhanced by slow cooking method. As I need to work, and wish to cook the ribs till very tender which can be achieved only by hours of cooking. I cooked it first in the wok, and then, transferred over to slow cooker, early in the morning before leaving the house. Goodness! The pork ribs were so tender which almost melt in the mouth. To me, it taste better than the outside stores. If you ask me if there would anything to be commented, I would say….. 2 teaspoons of brown sugar might be a little too sweet. If you prefer more briny taste, reduce the sugar adding to 1 teaspoon instead, as desired. Other than that, this prawn noodle soup is a near perfect creation. It might look deceptively complicated to cook, but it wasn’t the case at all. Simple steps with ingredients easily available at the supermarkets or wet markets. You, too, give it a try! 1) Wash and shell prawns with tail remained intact. Cut a deep slit at the back of the prawns to devein, and keep them refrigerated to reserve for later. Then, trim prawn heads. Set aside the heads and shells for use in boiling soup base. 2) Blanch the pork rib by placing the pork ribs in a large sieve/ strainer, and pour hot water over it slowly. Reserve ribs for later. 3) Heat wok with 2 tablespoon of oil over high fire. Place and stir fry prawn heads and shells for about 5 minutes, or until shells turn deep orange and strong fragrant. 4) Reduce heat to medium fire before adding dried anchovies and brown sugar to the shells, continue to stir fry for 3 minutes. Add garlic and stir fry for another 3 minutes. 5) Add water to the mixture, return to high heat to bring to a boil. When boiling, add in star anise, cloves and black peppercorns. Let it boil for 2 minutes before adding dark soy sauce and pepper. Mix all ingredients well, before heat off. Transfer all ingredients together with broth to a slow cooker. Add in the blanched pork ribs, too. 6) Set slow cooker to auto/ low shift. Let the prawn soup and ribs simmer in slow cooker for as long as desired, till you are ready to serve your dinner. 7) About 10 minutes before serving, stir in salt. Scope out and discard the shells, anchovies and any surface scum. 8) Thinly slice/ chop shallots, and fry in 2 tablespoon of oil over medium fire, until browned. Immediately remove from wok, and drain on kitchen towel. *Do not over-fry to allow standing time. Reserve for garnishing later. 9) Return prawn meat from refrigerator, and blanch the prawn meat with boiling water till pinked. Removed and set aside. Discard and change to another pot of boiling water, blanch noodles and kangkong (and bean sprout) for about 2 minutes. Remove noodles and vegetables with a sieve/ strainer, and plunge into a large pot of cold/ iced water for 5 seconds. Then, return to the hot water again for another 5 seconds. This is to let the noodles remain springy and a little chewy (Chinese called it: 过冷河). Drain and divide into 4 bowls. 10) Add cooked prawns and ladle broth into each bowl of noodles. Garnish with shallots (and hot chili). Serve hot. No slow cooker? If you are not intend to use a slow cooker, skip the transfer! Simply remain with wok and let the stock simmer for 1 hour, or until pork ribs are softened. 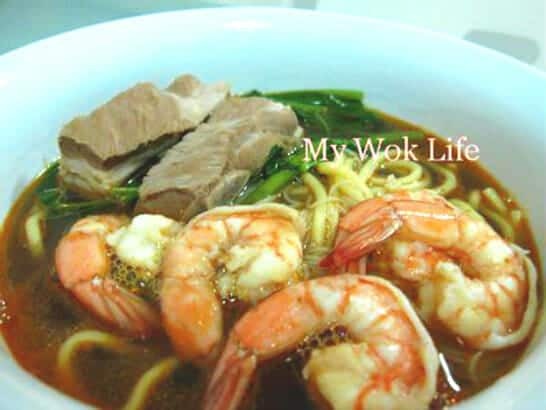 A bowl of prawn noodle soup with prime pork ribs counts about 370kcal. Tips: Heads and shells from 24 prawns are needed for the soup base. However, if 24 prawn meat to be consumed are too much for 3 – 4, store the unused prawn meat for future cook or other dishes. Alternatively, “save” prawns shells/ heads gradually over 2 – 4 weeks. if you do not wish to get so many prawns at one time. Store the shells/ heads in a large zip-log bag and freeze it (in the freezer). Simply thaw the shells/ heads 30 minutes before cooking this dish. * For easy removal of prawn shells and dried anchovies in the broth after cooked, you may first put the ingredients in a disposable soup bag, boil the broth with the soup bag of ingredients. * Alternate way of handling prawn meat: Prawn meat may also be cooked first, before storing in the refrigerator. Blanch the prawn meat in boiling water till pinked, after removal of shell & head, and deveined (in step 1). Then, store cooked prawn meat in the refrigerator. Cooked prawn meat can be taken out from refrigerator at step 7. Just plunge the required amount of prawn meat in the soup for 30 seconds (to warm it up) before serving it on bowl(s). hi sorry if this is a stupid question coz I’ve never made this before. At which point do you add the prawns and the pork ribs? It sounds like the pork ribs should be added together with the broth into the slow cooker to cook for however long, right? What about the actual prawns? And if I’m only cooking for two, would using less prawns affect the taste of the soup? 1) Pork ribs – Yes, the ribs are to be added in the broth into slow cooker for extended boiling in order to make ribs super tender and soft. By adding ribs into boiling broth also makes the broth more flavoursome. 2) Actual prawn meat – prawn meat have to be boiled/ blanched in separate pot of boiling water, at any point of time before serving. You may have the prawn meat cooked first (in the morning), then put in the refrigerator till evening when you need to serve the noodles at dinner time. Or, store the raw prawn meat in refrigerator till evening and cook/ blanch it only when you are cooking/ blanching the noodles and Kang kong. 3) Cooking for 2 – Reduce the amount of water, too, if you are reducing use of prawn shells/ heads in soup stock. However, I’m afraid the amount of prawn shells and heads (5-600grams, common required amount should be doubled.) I used were already considered very minimal. My concern is the taste might not be rich enough, if you further reduce it. I have an idea, what you do is, you may try to ‘save’ the prawn shells/ heads over 2 – 4 weeks, before cooking this dish. Store the shells/ heads in a zip-log bag and freeze it. Its freshness can be retained and last if it’s frozen in the freezer. Just thaw it 30 minutes before cooking. Hi Pat, i just tried this recipe last sun (yest) and wow, the fragrance was awesome. it was oozing outta my slow cooker. the taste of the broth was alright….but that’s because i cooked for 2. so naturally i thot, then the quantity shd b divided by 2 also. that was before i read this post. anyway ya like wat Pat said, better to use more prawn shells, will definitely make the soup tastier. however 1 problem which i faced was, the recipe did not state when the pork ribs will come into the picture. it only says to blanch them and save them for later use. so anyway i only put them into the slow cooker, i didn’t boil them with the rest of the ingredients in the wok. but that shouldn’t be the way right Pat??? You are right. You should ratio the amount of ingredient according to your serving. Divide into half of the amount for two was correct. I am happy that you liked my recipe. 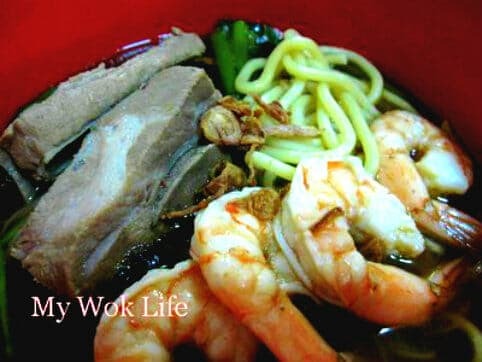 I want to try cooking the prawn noodle soup with prime ribs this weekend. However, my children does not take spicy or chilli stuff. So, can I leave out the hot chilli in the soup. Will it tastes nice without the hot chilli. Hmm… I din think i’ ve added hot chili in this recipe, except some chili julienne for ganishing.. If this is what u referred to, then yes, you may ignore it.. It won’t affect the taste of the soup.. This soup base is basically non spicy, anyway. Enjoy! Haha…. Probably… But I will suggest you to add more prawn heads and fry it really fragrant before use. That might help. OMG! I can’t believe I actually found this! Of all the prawn noodle recipes found on the internet or cook book, This recipe and method is the most authentic. My family used to sell prawn noodle so I know a thing or two. The essence of Hae Mee is the soup. I see you actually used Slow Cooker to boil the soup (Small fire) over long period. The soup base has become ‘Dun Tang'(炖汤) instead of boil soup (滚烫）. It will taste better than outside hawker stall because of the Pork Ribs/slow cook method. Also the soup will be richer and thicker in favour, you can add some boiling water to dilute the soup if it is too thick. You have also correctly mentioned frying of prawn heads to be used prior to cooking the soup. Outside commercial hawker is unable to do this because of commericial reasons. They will substitude with Tek Jia (Black Bamboo) and Pork Leg plus MSG. Some don’t even bother to add Pork Leg. Also the hawker need to prepare a larger serving so cannot use Slow Cooker. I am a SG living in Thailand and this morning I woke up with a strong craving for Hae Mee and this is how I ended up here. Good work! This blog will be in my browser bookmarks! Hi, after cooking the broth in the slow cooker. Can I leave it overnight? Hi, if i cook the broth in the slow cooker in the evening. Can I leave it overnight! No problem to leave it overnight in slow cooker. Am I right to say that the amount of ingredients you gave only serves 2? It’s to be served for 4, instead. You can see the serving size at the top right corner of each post, actually. I tried this recipe today and gotten rave reviews from my family! Given the steps, cooking prawn noodles isn’t as daunting as it seems. Thanks for sharing! 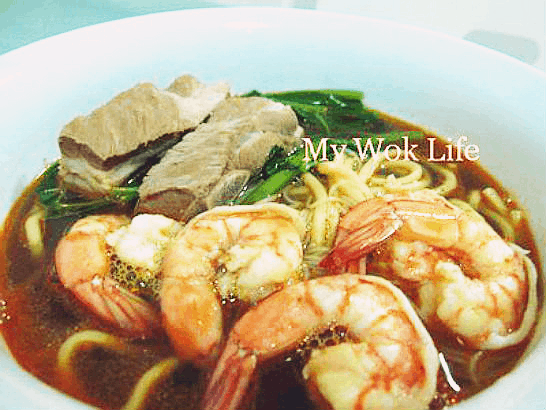 I previously asked if you have any idea for the dry version of this prawn mee? Any suggestions? Thanks! Diana, so sorry as I do not have the time to work this out yet.